We know little of the quality of agriculture in the fifteenth century but, as today, it doubtless varied according to factors, such as climate and the economy, beyond the control of the farmer. The poets often praises their patrons for their ability to cultivate the land by ploughing and sowing. As well as amaethwr, the terms hwsmon, llafurwr and arddwr were used of those who cultivated the land. There are illustrations of monthly and seasonal activities of farmers in medieval calendars and NLW MS 15537C - ‘The De Grey Book of Hours’ - is a fine example of a fifteenth-century calendar (see 'The 'De Grey' Hours' at the Digital Mirror, National Library of Wales). 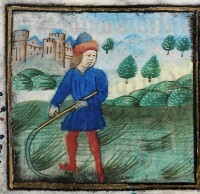 In the miniatures that accompanies the months, there are illustrations of a farmer sowing in October and reaping in July and the equipment in use are clearly illustrated. Farming equipment was used for the first time in the fourteenth and fifteenth centuries and with the help of simple tools such as the plough, farming gradually became a little easier.